111165+ web files, a regularly updated Gazetteer, overall an in-depth description of our island's internally self-governing British Overseas Territory 900 miles north of the Caribbean, 600 miles east of North Carolina, USA. With accommodation options, airlines, airport, actors, actresses, aviation, banks, beaches, Bermuda Dollar, Bermuda Government, Bermuda-incorporated businesses and companies including insurers and reinsurers, Bermudians, books and publications, bridges and causeway, charities, churches, citizenship by Status, City of Hamilton, commerce, communities, credit cards, cruise ships, cuisine, currency, disability accessibility, Devonshire Parish, districts, Dockyard, economy, education, employers, employment, environment, executorships, fauna, ferries, flora, former military bases, forts, gardens, geography, getting around, golf, guest houses, highways, history, historic properties, Hamilton, House of Assembly, housing, hotels, immigration, import duties, internet access, islands, laws, legal system and legislators, main roads, marriages, media, members of parliament, money, motor vehicles, municipalities, music and musicians, newcomers, newspaper, media, organizations, parks, parishes, Paget, Pembroke, performing artists, residents, pensions, political parties, postage stamps, public holidays, public transportation, railway trail, real estate, registries of aircraft and ships, religions, Royal Naval Dockyard, Sandys, senior citizens, Smith's, Somerset Village, Southampton, St. David's Island, St George's, Spanish Point, Spittal Pond, sports, taxes, telecommunications, time zone, traditions, tourism, Town of St. George, Tucker's Town, utilities, water sports, Warwick, weather, wildlife, work permits. Bermuda is a 21 square mile (56 kilometers) in total land area cluster of mostly-interconnected small islands in the north west Atlantic Ocean. It has about 65,000 residents and about 500,000 visitors mostly from cruise ships. It is located about 600 miles due east of the nearest mainland, the USA's North Carolina. It is not in the Caribbean but 900 miles north of it. 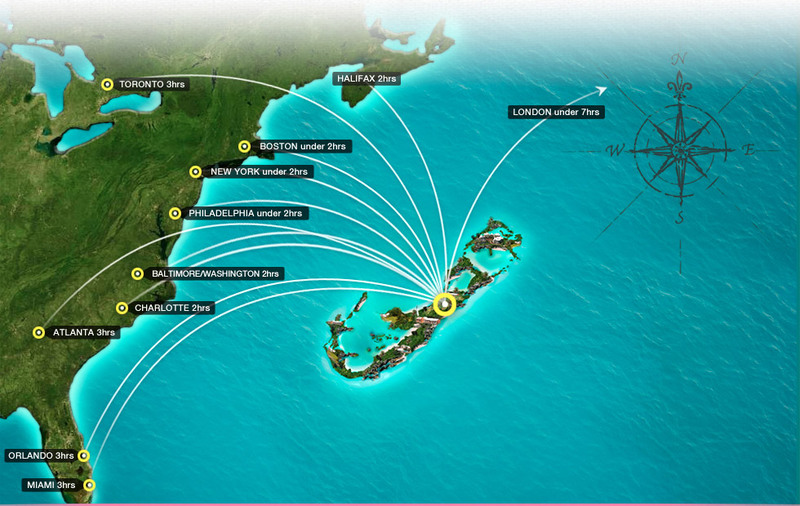 There are no regular airline or shipping services between the Caribbean and Bermuda, only with the USA, Canada and Britain. It is Britain's oldest British Overseas Territory, self-governing, with its own laws including those on citizenship, commerce, customs duties, employment, finance, health, insurance, investments, hospitalization, immigration, taxation, trade, welfare, etc. It is not part of the European Community, unlike Britain. Despite its small size it is an important offshore business centre, particularly for insurance and reinsurance companies. The World Bank - see http://data.worldbank.org/country/bermuda - rates it as one of the top jurisdictions in Gross National Income per capita. The cost of living is very high. Gifts up to a value of US$30. Those who are Bermuda nationals (Bermudians) or newcomer now-resident non-Bermudians who go to an overseas country on vacation (holiday) for short periods or for longer, for work, study or treatment and are now returning to Bermuda. Gifts up to a value of US$200. Since April 1, 2013 tourists and visitors and returning residents who bring in more than the above will be charged Customs Duty at the rate of 25% of Bermuda Customs Officer-assessed Bermuda retail price approximate value for most imports including cameras, clothes, electronics, jewelry, watches, etc but at specific rates of import duty for all spirits at $10.63 a litre, wine and champagne ($2.89 a litre) and tobacco ($33.5% of value. No duty is ordinarily payable on prescription drugs, spectacles or computer software imported in small quantities for reasonable personal use. Duty Free on Airlines traveling to Bermuda from airports in the UK, etc is not Duty Free in Bermuda unless the airline purchase and the value of all other purchases made abroad combined fall within the $30 limit for tourists and $200 for returning residents. Visitors should be aware of this as any savings from buying duty-free from airport stores or airlines traveling to Bermuda can easily mean paying substantial duty in Bermuda if they exceed the small Bermuda Duty Free allowances. It should be noted carefully that Bermuda does not regard them legally as immigrants but as newcomers who come to Bermuda on Work Permits and intend or hope to stay on the island, not indefinitely but for a period of time to satisfy specific employment contracts. On their first arrival as newcomer residents and if they have valid Work Permits, they can claim a Transfer of Residence Allowance (TRA). Even their pets qualify for a TRA, with prior approval before arrival. However, it must be noted they cannot bring any automobiles or other motor vehicles whether used or new, no motor cycles or mopeds or scooters over 100 cc. All other modes of transportation such as mobility scooters, even wheelchairs, private yachts etc do not qualify for TRA and new residents will need to pay full duty on them, whether new or used. Used items normally requires new residents to prove they are used for at least 6 months or more, to qualify for some customs duty relief. They should carry invoices (bills) as evidence of date of purchase. If they import to Bermuda by air or sea they should apply for the TRA within 3 days of importation, otherwise on their arrival in Bermuda. New items may attract duty beyond the duty free allowances and applicable duty depends on the items. Note carefully that for all items purchased new in USA, Canada, UK or from anywhere else and brought into Bermuda both residents and newcomers should carry the actual bills or invoices or other confirmations or receipts of purchase. Failure to do so will result in payment of Bermuda customs duties based on assessed value, usually much higher Bermuda retail prices than those applicable abroad. Returning residents once again have the pre-September 2011 per person duty-free allowance of $200 (still very stingy by international standards). In past years, Bermuda consumers have suffered significant reductions in this duty-free allowance, from $400 per person in the 1990s to $200 per person to $100 per person. Over and above the duty-free concessions applicable only to returning residents there is now a by international standards a very high duty rate charged on all goods imported for personal use. 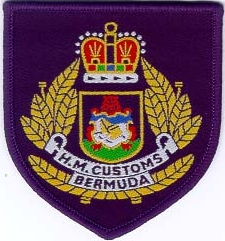 HM Customs, Bermuda. See http://www.customs.gov.bm/portal/server.pt. Bermuda Customs Tariff in full (hundreds of pages). See above. Most US online retailers refuse to ship directly to Bermuda themselves, including Old Navy (which does ship to some Caribbean islands) and Walmart. Most do not like to ship outside the US because of the risk and hassle of international shipping, plus each non-US jurisdiction - such as Bermuda - has different customs requirements (such as those listed below in Bermuda), invoices, declarations, duty issues, forms/waivers, clearing/power of attorney issues, bond posting requirements etc. But particular Bermuda-based entity can quite easily overcome the fact that most US retailers won't ship overseas, by having goods routed to a US address forwarding center, then air-freighted to Bermuda, with the organization concerned paying the customs duty and billing the personal or corporate customer. Delivery is within two to three business days once received at the forwarding center in New Jersey. Dedicated agents take care of all the paperwork, make sure the shipment is packed well in order to save on costs, and ensure invoices etc. are in order. When the order arrives in Bermuda an agent will call the client to collect it. It is Bermuda’s fastest, most reliable and cost-effective way to bring in merchandise into Bermuda. There was a time - but no more - when tourists to Bermuda delighted in the bargains they found on Front St. They returned to the USA, Canada, etc. with cashmere sweaters, Liberty scarves, Harris tweeds, perfumes along with china, glassware, cameras and jewellery. Bermuda advertised itself as a place where goods were cheaper than in the USA and elsewhere and, as a further incentive to shop in Bermuda, there was no sales tax. There still is none, but most goods available in Bermuda are now appreciably more expensive than those bought in USA, Canada and UK. As merely one example of this, consider a pair of shoes retailing in the USA for $59, but costing $112.94 in Bermuda, with the additional $53.94 once all the additional costs — customs duty, shipping according to weight, insurance and fuel surcharge and local mark-up — are factored in. Samples sent to Bermuda are rarely duty-free. Organizations or individuals overseas with an interest in and new to selling their goods in Bermuda via local majority-Bermudian-owned and managed companies (only these are allowed to trade in the local market place) should take care not to send samples without prior notice. They should always pre-advise their Bermuda agents if they wish to send a sample or samples and ask about rates of customs duty payable both on the samples and on orders. Generally, only if the samples are single items, packed separately, and valued at about $12 or less is it possible they not attract Bermuda Customs Duty of 25% or more of Bermuda-assessed value depending on their Bermuda classification. Otherwise, those rates of duty are payable by the receiver, even on samples. The Bermuda Post Office (BPO) has advised the public to bring an invoice when collecting goods through the post office. As the BPO acts as an agent for HM Customs, anyone who has received a notification from the post office indicating “value required” must produce the actual invoice when collecting a package so the required duty can be paid. If an invoice is unavailable, a vendor or manufacturer-estimated retail value for the item or similar product must be provided. This can be obtained from the internet and presented in lieu of the actual invoice. Duty is not required for gifts valued at under $30 when sent from overseas. For more information on services provided by the Bermuda Post Office please visit www.bpo.bm. Entitled to a per-person duty-free exemption for newly purchased goods up to the value of $800 if the goods accompany you when you arrive back in the U.S.
Alcohol - Alcoholic Beverages One liter (33.8 fl. oz.) of alcoholic beverages may be included in your exemption if: You are 21 years old. It is for your own use or as a gift. It does not violate the laws of the state in which you arrive. Gifts - A non-resident may bring gifts totaling $100 in value to the U.S. duty free. Any gift items over that amount will be dutiable at the same rates as gifts exceeding $800 for each returning resident. Tobacco. Permitted to bring 100 cigars or 200 cigarettes (one carton) into the US duty free. Goods in excess of $800 that accompany you are dutiable at a flat rate of 3 percent for the next $1000 in value, goods that are not covered by the personal exemption or flat rate of duty (anything over $1800) are assessed duty in accordance with the item's Harmonized Tariff Schedule (HTS) classification number. If household goods less than a year old do not accompany you then they are subject to the duty rate applicable to each item's HTS classification number. The current rate is £390. (About $487 at the rate applicable in early April, 2017). They must transport the goods themselves. The goods are for their own use or as gifts. If the persons to whom they give the goods pays them for bringing them in in any way - including reimbursing them for any expenses or payment in kind - then it's not a gift and the goods may be seized. 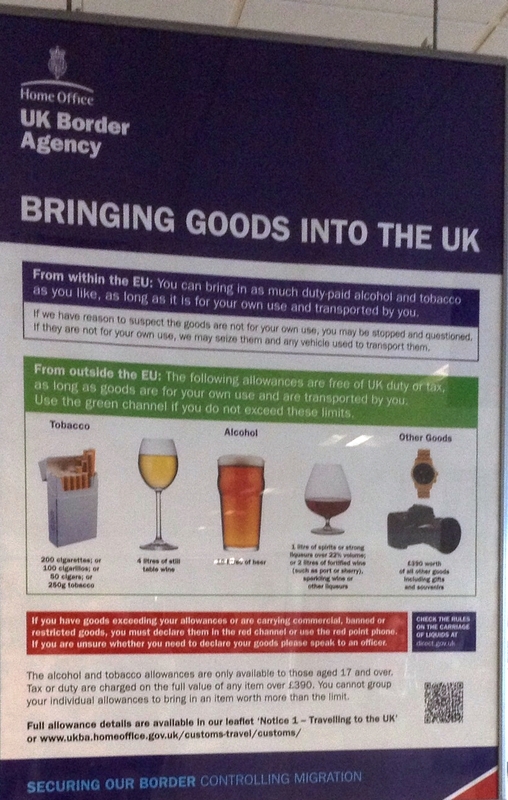 The goods are duty and tax paid in the EU country where they were acquired. If these conditions are not meant, the goods and any vehicle that transported them, may be seized.